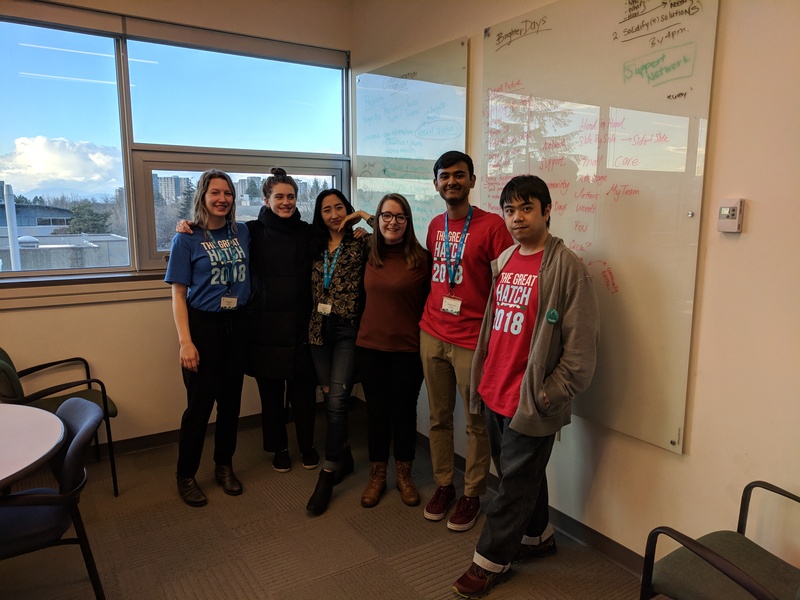 The Great Hatch 2018, an annual hackathon presented by Hatching Health, took place from March 2-4 at the UBC Engineering Design Centre. Sponsored by the UBC Faculty of Engineering, the UBC faculty of Medicine, Joule Inc., and a host of other stakeholders, the annual Great Hatch ‘aims to harness the potential we have as humans to create and critically think to solve problems and improve lives’. Caroline Sutton participated in the Great Hatch this year as a UBC Science student. She is currently working in a co-op placement with Dr. Gina Ogilvie’s team and spent 8 months working on women’s health surveillance indicators under Dr. Ann Pederson, Director of Population Health Promotion at BC Women’s Hospital. To prepare for the event she completed a training period with entrepreneurship@UBC to work on developing her ‘pitch’ for the event. Her ‘pitch’ focused on the current lack of techniques for incorporating Intersectionality theory into population health data analysis and presentation. The event began on March 2nd with the 100 Hatching Health participants networking and brainstorming. Participants include experts and students in product design, engineering disciplines, software and web development, and health sciences. Pitches were presented early Saturday morning, and participants organically wandered the room to create teams lead by the person who pitched. Almost all of the participating engineers were interested in joining teams with a mechanical engineering problems such as designing biomedical devices, take-home screening tools, surgery aids, and medical implants. Wildly popular pitches were given by practicing surgeons and experienced emergency room doctors. Although Caroline was not able to find an engineer to form a complete team with her pitch, she joined a different team to work on decreasing social isolation in paediatric patients during long-term hospitalization. Her team will continue the work starting in May to advance the project as far as possible. The rest of the event was spent working to produce a proof-of-concept prototype in time for Sunday night presentations, followed by an adjudication session and awards ceremony. The team Caroline joined received positive feedback from the judges for project integration and design, and the team was praised for designing a solution that could be feasibly implemented in current hospital settings. The award winning teams tackled issues like designing home devices to detect neuropathy, improving the shape and design of central venous access catheters, and adapting airport security technology to monitor vital signs in ED waiting rooms. Overall, it was an amazing weekend of collaboration and intense team building, and most teams left on Sunday with future plans to improve their prototypes. Previous Previous post: Dr. Saraswathi Vedam is in the news!